Deaccessioning is defined as a permanent removal of a work of art from a museum’s collection. It involves several steps, such as review of terms under which an object may be considered for removal, legal restrictions and ethical considerations associated with deaccessioning. Deaccessioning is a very controversial and also emotional issue that has been addressed from different viewpoints. On the one hand, there are clear economic justifications for it. If some artworks are hardly displayed or not consistent with the main collection, their sale will save conservation and insurance costs. Proceeds can then be used for new acquisitions, which can improve the quality and focus of the museum’s collection, or for keeping quality and security standards. On the other hand, there are important reasons to evaluate the option of deaccessioning with some caution. Museums are institutions that hold works in public trust. They are custodians of our memory, and their collections have a fundamental educational role. Even if the bulk of items they preserve (think of the objects from archaeological excavations, for example) cannot possibly be displayed, they may still be helpful for scholars. Therefore deaccessioning may hinder conservation, education, and research. Furthermore, society may regret deaccessioning in the future: deaccessioning could be influenced by preferences prevalent at the time when it takes place. National laws on the topic differ substantially. We have countries (e.g. France, Spain or Italy) where deaccessioning is largely prohibited and others, such as US and UK, where public institutions can legally deaccession artworks. Nonetheless, even in those countries where deaccessioning is legally allowed, museum associations tend to strongly oppose it. The main reason, as stated by the by the National Museum Directors, is the fear that collectors may be reluctant to donate works to museums if they suspect that in the long-term they may be disposed of. This event would be particularly worrying for museums, which are increasingly dependent on bequests to acquire artworks that they would otherwise be unable to buy. This possibility is formally investigated in our paper titled “Better an egg today than a hen tomorrow” focusing on the implications of deaccessioning for donations to museums. We develop a sequential game with asymmetric information between a donor and a museum, where the former is uncertain about the commitment of the latter not to deaccession part of its endowment in the future. The inter-temporal economic perspective, which examines the interaction of deaccessioning with public funding and private donations, is helpful to ascertain how the uncertainty about the future decision of a museum about deaccessioning may have an impact on private donations of artworks to museums (making deaccessioning even more needed). In the model, in-kind donations are assumed to be motivated by the intrinsic reward (that donors receive when their bequest is enjoyed by the public) and museum’s funds are used to finance services (such as new exhibition spaces, or longer visiting hours) or to buy new artworks with the aim of increasing attendance. We show that deaccessioning triggers a hold-up problem that affects donations. When it can be implemented by museums, donations decrease for all museums, indifferently from the ability to infer museums’ type. In other words the possibility that deaccessioning will take place in the future will harm all museums, independently from their true willingness to exploit it. This result provides an intuition for the widespread resistance of museum directors to deaccessioning and for their efforts to enforce strict guidelines. It also validates the recent trend of important collectors to finance their personal museum or foundation. The study also investigates the option of storing rather than selling artworks and is extended to include congestion effects. The main intuition is substantially unchanged. It is also interesting to notice that public support may have a perverse effect of reducing donations even to museums that never recur to deaccessioning. The reason is that an increase of public grants to museums reduces the need of immediate deaccessioning and makes more difficult for donors to understand the museum willingness to deaccession in the future. 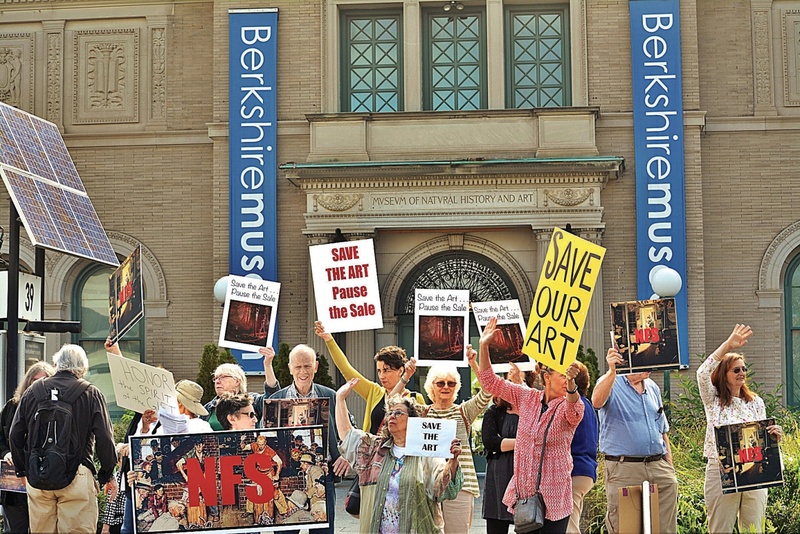 Public support is shown to be harmful also when it increases the art endowment of a museum beyond its exhibition capacity. In fact, an increase in the probability that bequests are not going to be shown – partially or entirely – due to congestion of exhibited works reduces the incentives to donate and increases those to deaccession. Isidoro Mazza, Dept. Of Economics and Business, University of Catania. Email: imazza@unict.it. EconomistsTalkArt.org wishes you happy holidays and a great new year 2018!